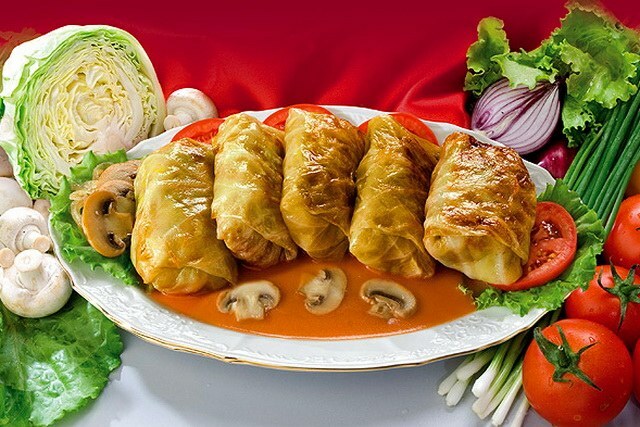 Stuffed cabbage - a dish that is cooked in many countries. Varieties of this wonderful food are many. One of the most common options are the classic stuffed cabbage of cabbage and minced meat. A head of cabbage to wash, cut the stalk and hold for 7-10 minutes in boiling water. When the leaves become soft, remove the head and let the water drain out. Then separate the leaves and slightly repel thick stem or carefully cut it. If you use meat, and not ready ground beef, thoroughly wash the piece, peel off the film and bones. The flesh and onion through a grinder / Mincer. In prepared stuffing add the washed rice, one chopped onion, salt and pepper to taste. If you want to mince in the finished cabbage rolls were more dense, then stir in one raw egg. On each cabbage leaf put cooked ground meat and wrap in the form of an envelope or sausages. Edge of the cabbage leaf must be tucked into sausages. Pour into the cauldron (the pan) the oil, fry until Golden brown chopped onion, add sliced tomatoes (or tomato paste), a little put out. Put in a large kettle (pan) cabbage rolls seam side down. Pour boiled water to cover them by about 3-4 inches. For flavor you can put a few peas of black and fragrant pepper and Bay leaf. Cover and on low heat simmer for 35-40 minutes. The finished cabbage rolls can be served with sour cream, sprinkled with dill or parsley. The most delicious cabbage rolls turn out when you cook them in a cauldron. But you can use a deep pan.